A fisherman jumps into the Mekong River at the end of his early morning work on the fish traps on the east side of Don Khon. 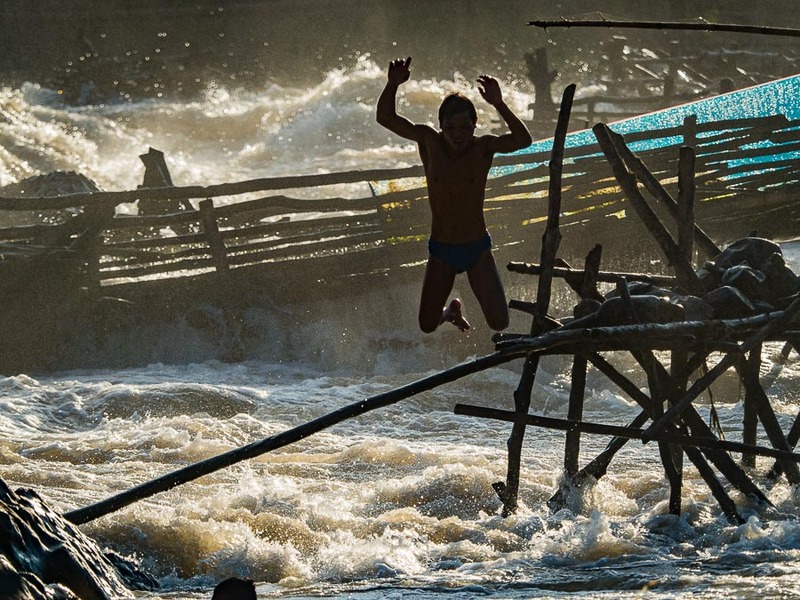 The Mekong River provides sustenance for most of Southeast Asia. It starts in the Himalaya Mountains in southern China and winds through the mountains before entering Southeast Asia at the Thai/Burmese/Lao border. 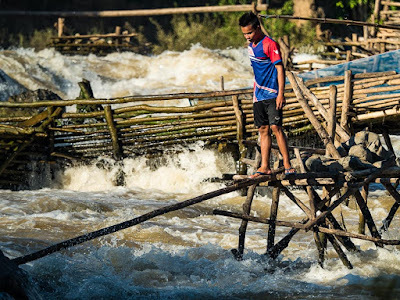 There are a series of waterfalls on the Mekong in southern Laos that have long prevented the river from being navigable from its mouth in Vietnam to its headwaters in China. French colonial expansion in Indochina was driven, in part, by efforts to find a shortcut to China. The waterfalls in Laos killed that dream. 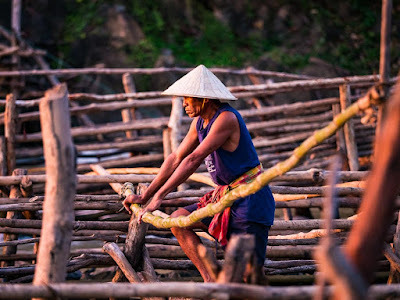 A fisherman relaxes near the fishtraps at Don Khone. 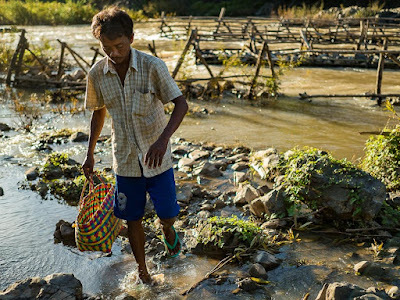 The waterfalls that stymied the French though help feed southern Laos. Fisherman on Don Khone, one of the larger islands in the 4,000 Islands of southern Laos, built a vast network of fish traps that bring in tons of fish that are sold in markets throughout Laos. The fisherman have plied their dangerous trade for centuries. They've built a system of rope and bamboo bridges that go from trap to trap and they work, like a aerialists as the river's waters swirl beneath them. A fisherman walks on a bamboo bridge that runs from the fish traps to the shore. The fishermen's days may be numbered though. The total size of the catch has not gone down much in recent years, but the size of the fish caught has gone down. In other words, the fishermen are bringing in more but smaller fish. 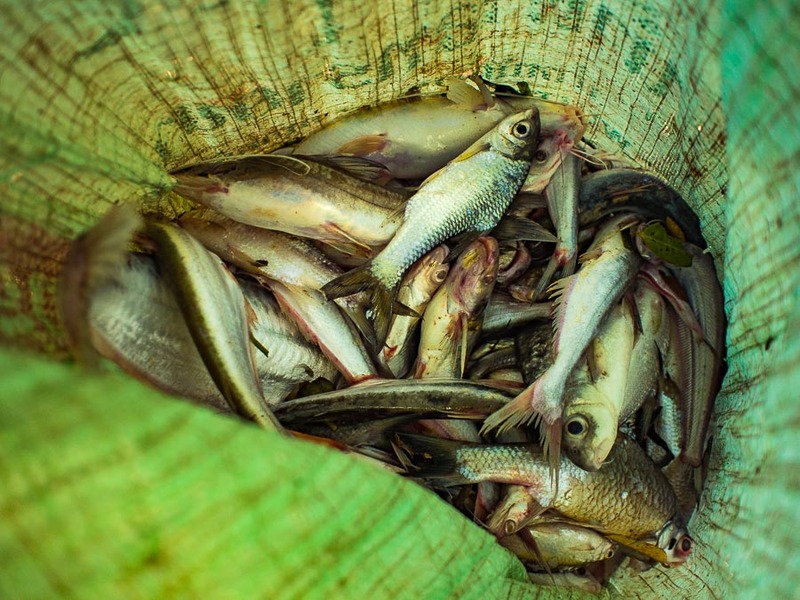 The Lao government blames the drop on over fishing, and over fishing may contribute to the size of the fish caught. 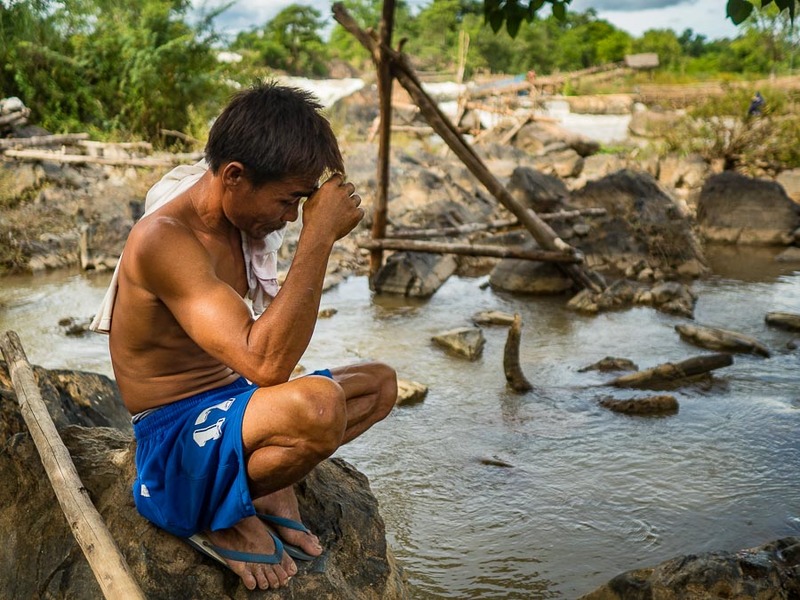 But fishermen say the real problem is the dams that are being built all along the Mekong, from China right through to Cambodia. The fishermen think these dams are dramatically impacting the migratory routes of the fish. A day's work in the bottom of a fisherman's nylon bag. The Lao government has ordered the fishermen to stop fishing. Although they haven't given them a date that they must stop by, the fishermen only work the traps during the dry season, when the river is low. The rainy season is starting on the river and river levels are rising so the season will end soon and the question is whether or not the fishermen will be allowed to start fishing again next year when the river levels fall. A fisherman stands near his traps and looks upstream. 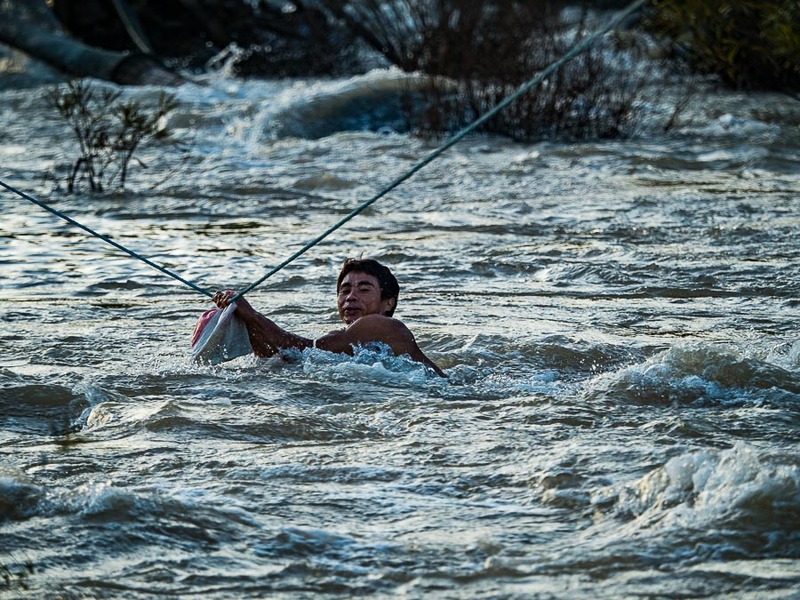 A fisherman uses a rope bridge to cross the river. They grab hold of the rope, step into the raging river and the currents pull them through the maelstrom to the other side. I'm glad I was able to go to 4,000 Islands and Don Khone when I did. I was privileged to see the fishermen work. I'm not sure how much longer they'll be on the river. 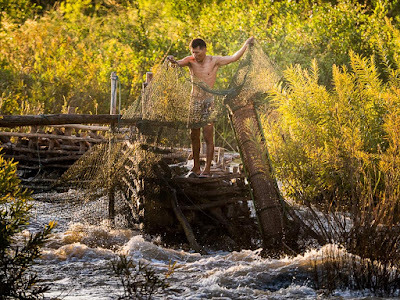 A fisherman pulls in his nets on the other side of the river. While another fisherman walks back to shore with his day's catch. There are more photos of the Don Khone fishermen in my archive or available from ZUMA Press.